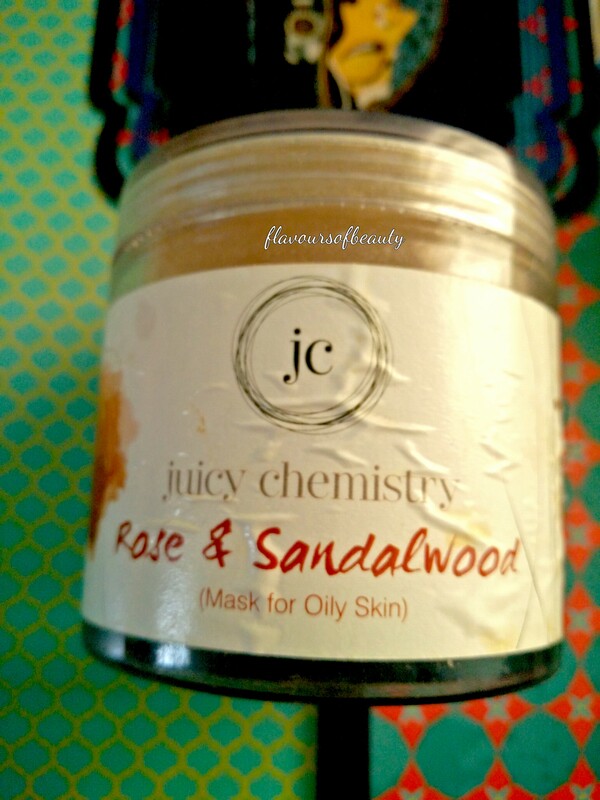 In this post I am reviewing the Juicy Chemistry Rose & sandalwood mask for oily skin. I really liked the divine smell of their Classic rose body butter, that made me try other products in their rose collection. But to my dismay the rose lip balm, rose saffron soap or this mask, none of them has the same fragrance. But it is understandable as far as this mask is concerned, as it has sandalwood essential oil that always takes the centre stage when it comes to fragrance. Packing : The mask comes in a plastic jar with sturdy cap. It is travel friendly as it doesn’t spill. I don’t remember if it had a protective lid. Because I might have removed it later. So there is little spillage while opening the cap. Fragrance : Mostly of sandalwood essential oil. It is a soothing fragrance, of natural ingredients. 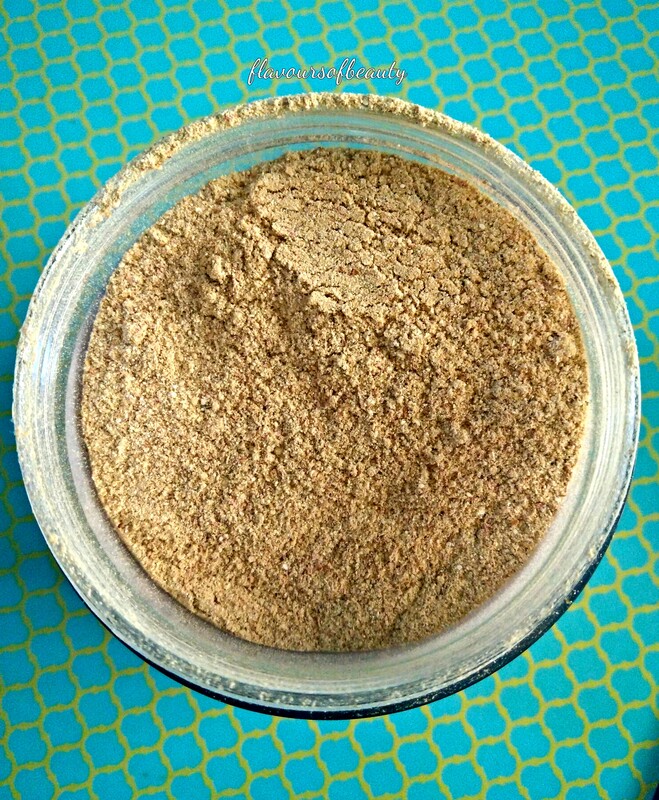 The texture is powdery with no harsh particles. On mixing with water it doesn’t forms a brown paste with smooth particles because of the presence of almond meal and orange peel. I prefer masks that can be directly applied on skin without having to mix with water. But this being a product with 0 preservatives, I am fine with taking that little effort. Since it is a clay based product it is good for oily skin. I have combination skin and I use this whenever I feel that my t-zone needs oil control. I mix this with tap water, make a paste and apply it evenly on my face and neck. This heats my skin a bit but there is no tingly effect. So while I prefer #justherbs anti tan mask (review here) to cool my sin after sun, this one I use to keep the oiliness at bay. It dries up pretty quick, in about 10min. But I don’t wait till the mask completely dries up. This is because, it can cause skin to stretch when it dries out and thereby cause wrinkles. The pack effectively balances out oily skin but it might parch dry skin. It doesn’t brighten up my face or bring a glow, but it controls oiliness of skin and keeps the skin fresh. Can’t say this one is my favourite clay based mask (review of which is coming soon) but when used regularly this does improve skin texture and controls oiliness. Not for people with dry facial skin. Nice review! Looks like a great product for people with oily skin. Clay based masks works well for oily skin and this had added benefits of essential oils. Just herbs clay masks are great as well. They are not in powder form, and can be applied directly. Previous PostPrevious Look what came in my mail today!